You don’t need to have a university degree or be a professional scientist to take part in a proper scientific project. Citizen science involves members of the general public working on their own or assisting professional scientists or scientific institutions in their work, for example by reporting where they have seen birds or butterflies or flowers. 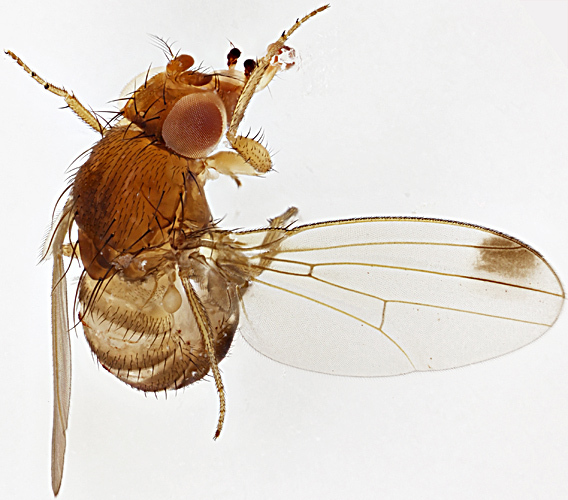 Most Quekett members own microscopes, so we can record the occurrence of very small creatures, and in autumn 2016 we were asked to trap and count fruit-flies and look for examples of the spotted-wing drosophila (Drosophila suzukii (Matsumura)). Most fruit-flies can only lay their eggs in fruit that is already damaged, but this one can make holes in undamaged fruit and so it can become a serious pest. It was first found in China, Japan and Korea, but it has now spread to Hawaii, North America and Europe, and has recently arrived in the United Kingdom. Chris Thomas gave us instructions on making a trap by making some 2–3 mm holes in a clean plastic bottle, and adding some apple cider vinegar (to attract fruit-flies) with a drop of washing-up liquid. 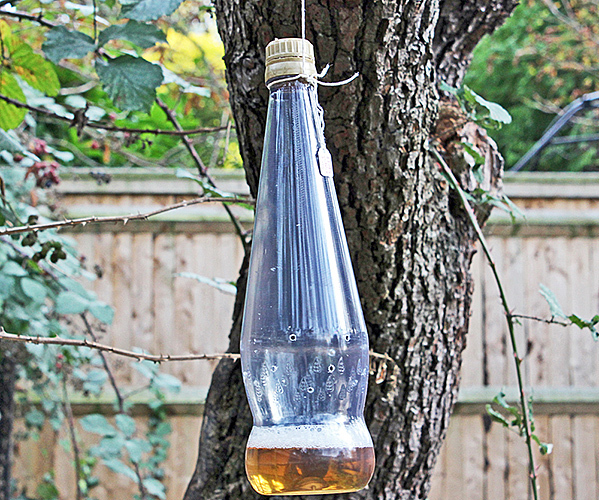 We then hung the bottles in gardens, fields and allotments to see what we could find. 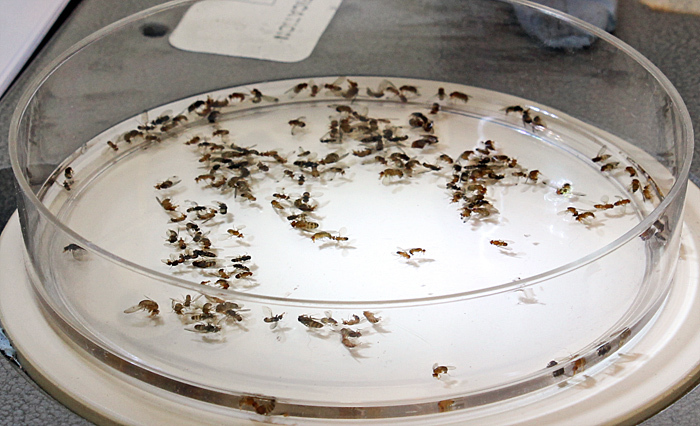 After 7 days, we rinsed the insects (to get rid of the smell of vinegar) and examined them with a stereomicroscope. 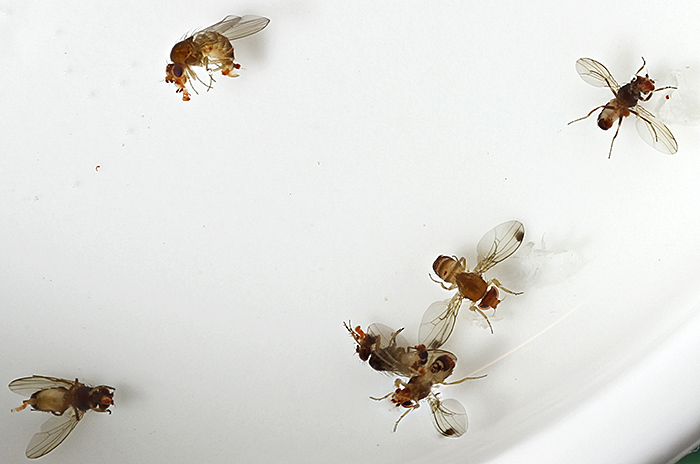 The flies are quite small, 2.5–3 mm long. 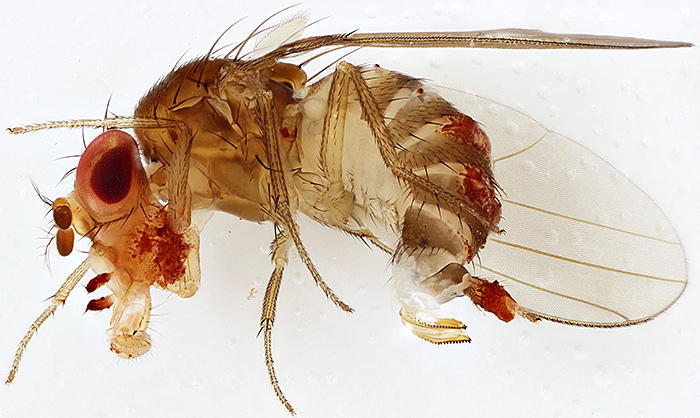 The male spotted-wing drosophila are easy to see, because they are the only ones with a dark spot near the tip of their wings. It takes a bit more practice and a higher magnification to find the females (they don’t have a wing spot), but once you have seen the serrated ovipositor it becomes easier. The ovipositor is the part of the female that is used to lay eggs. 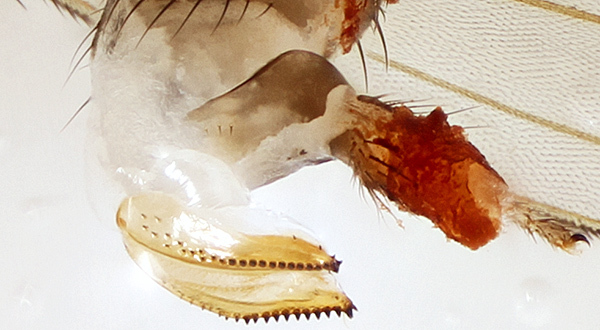 You can see the serrations (teeth) that enable the fly to cut into fruits that are not already damaged and lay their eggs. We counted the number of insects, the number of fruit-flies, the number of male spotted-wing drosophila and the number of female spotted-wing drosophila and sent our results to Chris together with details of the location. Chris is now working on a paper that will be published in the Quekett Journal of Microscopy, including far more data than he could have collected on his own, thanks to citizen scientists in the Quekett Microscopical Club.